This is where I am at! I have grafted (worked hard!) for the past few days, after seeing every ones progress on the instagram feed and feeling guilty about my lack of socks to show. These are painfully slow in my mind....I have loved learning the method, but the combination of thin yarn and small needles has got me bored beyond.....and I need some crochet in my life! I have a few more centimetres of pattern left and then a small amount of ribbing.....YAWN! I saw Joanne from Rose and Dahlia's socks still on needles, but also on her feet, and after reading how hard she found it, stupidly, I thought I'd try mine on too......how stubborn am I that it was a serious struggle and I began to wonder if my circulars were going to snap, but I still carried on....remind me not to do it again! Faith you are amazing, keep up the great sock effort. 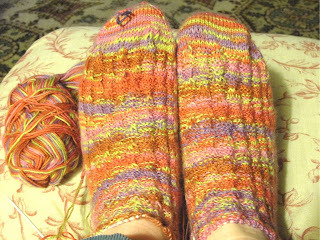 Very pretty, maybe sometime soon I will have the courage to attempt socks. You are doing a great job. They look wonderful. I'm still beavering away at my first second sock (if that makes sense) and it's WORSTED weight. To be honest, I am dreading making a pair with actual sock weight yarn. It's going to take forever and I know I'll feel guilty the whole time for going too slowly, or not finishing the second one, or who knows what. But if I don't make them I'll feel like I'm letting down the wonderful person who gave me the yarn. Ah well! I have never dared start knitting socks! I know many love it but your words make perfect sense: I'm afraid I would get bored too. I'm glad you popped them on like me! Did your family give you funny looks like mine did? Oooh! Your socks are sound, Faith! Makes think of orange sherbet ice cream for a girly, spring party.